November, when we feel the nights drawing in with a vengeance – an ideal time to take in some dark cinema. 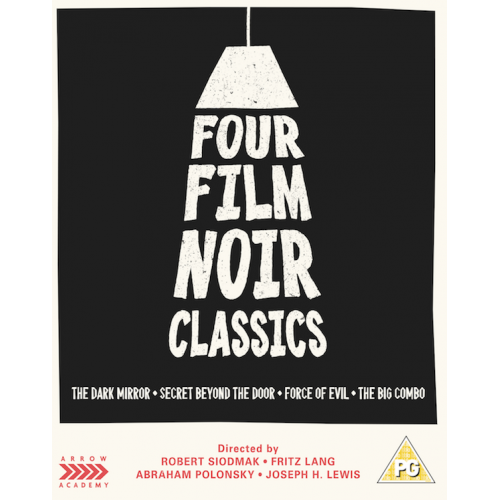 Arrow Academy are putting out a very attractive-looking set of noir movies on dual format Blu-ray/DVD packed with extra features on Nov. 20, and now up for pre-order here. In The Dark Mirror (1946), directed by Robert Siodmak (The Killers), a man is murdered and there’s an obvious suspect, but she has an identical twin sister (both played by Olivia de Havilland, Gone with the Wind), and one of them has a cast-iron alibi. The perfect crime? A psychologist with a specialist interest in twin psychology delves into the heart of the mystery, at considerable risk to himself. In Secret Beyond the Door (1947), Fritz Lang (The Big Heat) adapts the Bluebeard legend with a dash of Daphne du Maurier’s Rebecca. Shortly after their marriage, Celia (Joan Bennett, Suspiria) begins to suspect her architect husband Mark (Michael Redgrave, Dead of Night) of having a secret past, and wonders about the reason behind multiple rooms in his self-designed home, one of which is kept permanently locked. In Abraham Polonsky’s Force of Evil (1948), an unscrupulous lawyer (John Garfield, The Postman Always Rings Twice) scents a personal fortune when he concocts a plan to merge New York City’s numbers rackets into a single powerful and unbreakable operation, but reckons without his brother, who’d rather stay independent. And in Joseph H. Lewis’ ultra-stylish The Big Combo (1955), Lieutenant Diamond (Cornel Wilde, The Naked Prey) is determined to bring down mob boss Mr Brown (Richard Conte, Thieves’ Highway). But Brown feels the same way, and is far less constrained by the law, leading to some wince-inducing set pieces (some involving a pre-stardom Lee Van Cleef). This collection showcases many of the genre’s major names on both sides of the camera. In addition to the directing and acting talent mentioned above there are cinematographers Stanley Cortez (The Night of the Hunter) and John Alton (An American in Paris), composers Dmitri Tiomkin (High Noon) and Miklós Rósza (The Killers) and writers Nunnally Johnson (The Woman in the Window) and Philip Yordan (Johnny Guitar). It’s little wonder that directors such as Martin Scorsese and Quentin Tarantino were so struck by them. Seeing as I’ve written about, and enjoyed, three of these movies myself (The Big Combo, The Dark Mirror, Secret Beyond the Door) I’m certainly looking forward to what promise to be the definitive editions of these films. Robbing banks, holding up stagecoaches: That’s the life Jake Wade tried to leave behind when he put on a badge, found himself a pretty fiancée and set his path on the straight and narrow. But not yet. Wade’s outlaw partner resurfaces to take the lawman and his girl captive, forcing them into a trek to recover the loot Wade buried long ago — and plunging captors and captives into the violent heart of Comanche territory. John Sturges (The Great Escape) directs, continuing his string of rugged, character-driven tales of action. 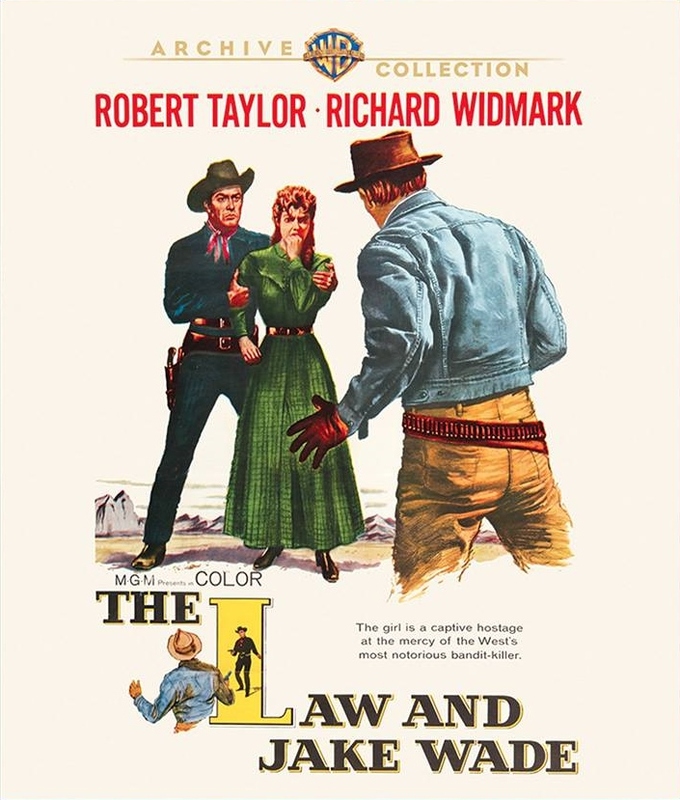 Robert Taylor and Richard Widmark deliver vivid contrasts as the resolute hero and the depraved desperado. And the snowcapped Sierras provide towering backdrops for the mounting clash of wills.